I’m often criticized for allowing (or causing) too much laughter in my ministry. I can understand that. In fact, I pray about it a lot. After all, God is holy and sometimes I wonder if laughter is appropriate before holiness. I believe, and have often said, that if you have never stood before God and been afraid, you probably never stood before God. Have you read in Isaiah 6 where the prophet encountered God in the temple? That chapter opens with these words: “In the year that King Uzziah died, I saw the Lord seated on a throne, high and exalted” (verse 1). Then the angels shout “Holy, holy, holy is the LORD Almighty; the whole earth is full of his glory” (verse 3). Isaiah was doing just fine up to that point. In fact, at the time, he was involved in church work, doing what people do in church (probably picking up the bulletins from the first service), when the real God of the universe came into the temple. It shattered every preconceived idea Isaiah ever had about God. His response was what yours or mine would have been. He cried out, “Woe to me!…I am ruined! For I am a man of unclean lips, and I live among a people of unclean lips, and my eyes have seen the King, the LORD Almighty” (verse 5). But I don’t think so. In fact, I think there’s much more laughter in this thing called Christianity than I ever thought. Whether or not you hear the laughter would not have been appropriate, the message Isaiah was given was not for joking either. He received a message of judgment. He was charged to call the people to repentance. But after the sorrow and the repentance, a veritable flood of laughter rushes out: “and the ransomed of the LORD will return. They will enter Zion with singing; everlasting joy will crown their heads. Gladness and joy will overtake them, and sorrow and sighing will flee away” (35:10). And then, almost as if we didn’t get the message the first time, he says it again several chapters later: “The ransomed of the LORD will return. They will enter Zion with singing; everlasting joy will crown their heads. Gladness and joy will overtake them, and sorrow and sighing will flee away” (51:11). When the people of God have been redeemed, God commands them, “Burst into songs of joy together, you ruins of Jerusalem, for the LORD has comforted his people, he has redeemed Jerusalem” (52:9). We get a lot of people who write to us at Key Life [Steve’s radio ministry], telling us that we make them laugh. Sometimes people write to tell me a funny story. Some have said that in their world, our broadcast is the one place where they smile. One listener said, “Steve, don’t ever get too serious. We need to laugh. I love what you teach, but I also love the fun you have doing it. It makes the teaching and living better.” Then I started feeling guilty again. I prayed, “Father, you didn’t call me to be a comedian. You called me to be a Bible teacher. Forgive me I’m not taking You seriously. Forgive me if I have made something light out of…” That was when my prayer was interrupted. I thought I heard laughter. I checked. Do you know what? I did. It was the laughter of God. So, I have discovered that one of my ministries is laughter. Not the laughter of derision or cynicism, or the laughter that follows a dirty story, but the free, uninhibited laughter of the redeemed. That kind of laughter starts at the throne. Heaven knows we have enough sour Christians. There isn’t much about the world to inspire laughter. The hurt and pain we experience don’t leave much room for humor; there’s probably more reason for tears than laughter in most lives. So maybe there’s a place for a ministry that doesn’t take itself too seriously, that lightens up the landscape a bit. Perhaps that doesn’t sound so very important, but I think it really is. God has given His people laughter and that laughter has great healing power. Don’t we sometimes communicate the same message to people? We say in effect, “Now that you have been forgiven of all your sins and you’re sure of Heaven, and now that you have meaning in your life and have found great power in prayer, you ought to be able to live a normal Christian life–as long as you don’t try to enjoy it.” Of course, biblical truth is important. Reaching out to those with significant needs is important too. We also need to have an uncompromising, clear, and forceful presentation of truth. But all that doesn’t exclude laughter–it includes it, transforms it, sanctifies it, even glorifies it. So let’s throw back our heads and laugh. God’s infinite riches are ours in Christ. What other reason could we ever need to laugh? Read Exodus 15:1-21 and 2 Samuel 6. For meditation: Take out some paper and put at the top of it “Reasons to Laugh.” Then begin writing under that heading what you have from God’s hand that’s cause for joy. Keep in mind that all good things come from God, so if you count your spouse, a friend, your home, or whatever or whoever else as a source of joy, understand that God is its ultimate source. It won’t take long before you discover how much you have to laugh about. Dr. Steve Brown is one of the most sought after preachers and conference speakers in the country. 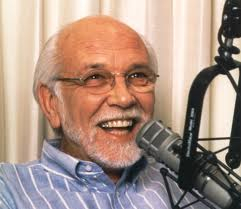 Having had extensive radio experience before entering the ministry, he is now heard weekdays on the national radio program, Key Life, and one minute feature, “Think Spots”. Steve also hosts a weekly radio talk show, “Steve Brown, Etc.”. He served as the senior pastor of Key Biscayne Presbyterian Church for 17 years before joining the Reformed Theological Seminary (RTS) faculty as Professor of Preaching. After teaching full time for almost two decades at RTS, Dr. Brown retired and is Emeritus Professor of Preaching but remains an Adjunct Professor of Preaching teaching occasional classes each year. Dr. Brown is the author of many (16 and counting) books and also serves on the Board of the National Religious Broadcasters and Harvest USA (He earned his B.A. from High Point College; an S.T.B. from Boston University School of Theology; and an Litt.D. from King College). Steve is one of my favorite writers and speakers because he is authentic, a great story-teller, is a theologian in disguise, and really knows how to address the realities of how sinful humans can experience the amazing grace of God. 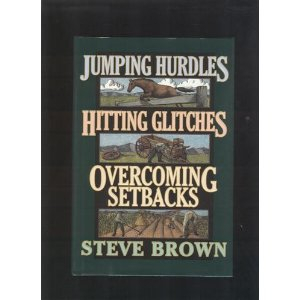 The article above was adapted from pages 202-205 in his excellent book on surviving and thriving in a tough world: Jumping Hurdles, Hitting Glitches, and Overcoming Setbacks. Colorado Springs: NavPress, 1992. If God is in Charge: Thoughts On The Nature of God For Skeptics, Christians, and Skeptical Christians.Grand Rapids: Baker 1983. Tags: A MEDITATION ON LAUGHTER, Christianity and humor, FRIDAY HUMOR # 27, Hitting Glitches, Isaiah 61:1-3, Jumping Hurdles, Laughter, List of Steve Brown's books, Overcoming hurdles, Steve Brown on laughter, Why Christians need to laugh more, Why laugh?